After we left Fundu Moldovei, we had to face the best kind of dilemma – which gloriously beautiful mountain pass route to take into the Maramureș region? Do we head over the Prislop Pass, which takes us through tiny villages and forests, or via the Bârgău Pass – the mainer road – which is highlighted as being scenic on the atlas? We choose, of course, the small road. It might not have been flagged “scenic”, but it should have been. The Bârgău (also known as the Borgo) Pass ruled itself out by virtue of being the main road – we’d been mixing it with plenty of trucks before we got to the Prislop junction – but this wasn’t as easy a decision as it could have been, by virtue of the Borgo also being known to Bram Stoker’s readers as the location for Dracula’s castle in the book. Whether there really is a castle there or not, we’ll have to find out another day. 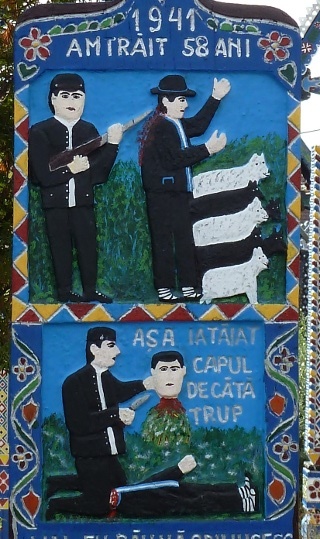 The other clincher for the Prislop road was the description our guidebook gave of the merits of one of the very first villages up the route – Ciocănești. 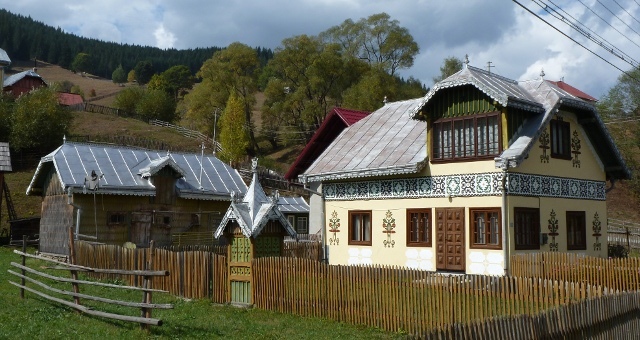 The Huțul, an ethnic minority group thought to have been nomadic Slavic shepherds from what’s now the Ukraine (barely a handful of kilometres away), have long built houses with very highly decorated and colourful facades. To our great delight, these were clearly visible as we passed through. After a long stretch of potholes joined by the occasional bit of tarmac, we headed up the pass – beautiful forests stretching for miles around us. However, the crowning of the pass itself was a bit unremarkable, and in the early throes of development, unlike the town of Borșa, the other side of the pass. Borșa hasn’t been in the early throes of development (or even decay) for a very long time, and aspired to “unremarkable”. For about fifteen kilometres, we headed through the town. Somebody, somewhen, must have thought it had merit – there was a whole pile of tourist infrastructure peering out from underneath dust and neglect – but what that merit was escaped us. Our initial impressions of Vișeu de Sus weren’t too different – then we spotted a little brown sign pointing up a narrow and shabby side road. We wound our way along for a kilometre or two, wondering if we’d missed something, then we started to pass the fence for a large sawmill, and spotted the car park entrance. We turned in – to find about ten large motorhomes all lined up for the night. We’d arrived at the Mocăniţă. One of Europe’s last working narrow-gauge mountain logging railways – and still with working steam engines, but only for the tourist trains. With typical timing, we’d managed to miss the tail end of the summer timetable by two whole days, whilst the winter timetable only ran from Thursday to Sunday. Since it was Tuesday, that meant we had a choice – to sit around doing not much in the carpark for two days, or to find somewhere else for a night in-between. At least we knew it existed, we knew there was space to stay overnight, and we knew for sure what the timetable was. Onwards, then. Seghet Marmatiei is the biggest town in the area. Better known as Sighet (or, as it quickly got christened in the van, Secret Marmite) it was the location of a prison which, during Communist times, became the preferred detention centre for high-profile political prisoners. 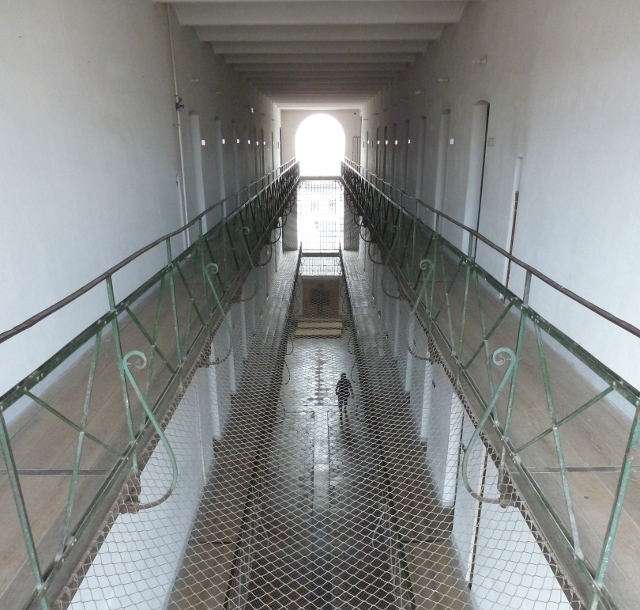 Romania’s Robben Island, if you like. Since the fall of the regime, it’s been restored and is now a museum and memorial centre to the victims of communism. After a night spent in a strange local campsite – pretty much the car park of a scruffy motel with a large and noisy factory just behind it – we headed into town, parked up, and went along. From the outside, most of the prison isn’t even visible – there’s only an innocuous doorway in the middle of a block. Once you go in, though, after a quick introduction and orientation, you’re straight into the cellblocks. 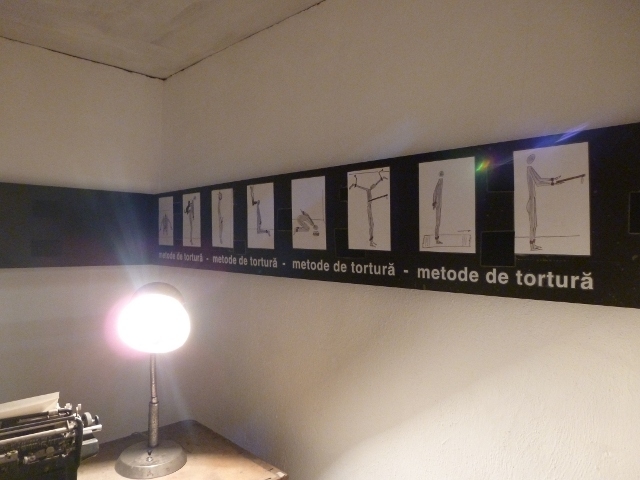 Some individual cells are reconstructed as cells – containing just the furniture that would have been there when a particular big name in Romanian politics was held in that cell. Some are empty, with no windows, just manacles on the end of chains attached to a large bolt in the floor. Those were the punishment cells. Most, though, focus on different aspects of the era, the regime, or the prison’s part in it. The museum is beautifully presented, albeit with little information in the displays themselves in anything but Romanian. No matter, we were given books of information, by cell, to take around with us – and they really helped to make some sense of it all. From the effects on the families left behind, to the medical problems faced by those imprisoned and tortured, to the kitsch items produced by the Ceașescu cult-of-personality industry, just about any aspect you could think of was covered – comprehensivel y but comprehensibly. One cell contained a large wooden planter, with grass growing in it, as described by Ellie when she used a picture of it for her latest Colourboration. Another cell was produced in collaboration with the Polish government, and looked at the timeline of the Gdansk shipyard strikes – how a handful of “troublemakers” led to the creation of the Solidarnosc union, then onwards to Lech Walesa’s presidency of the country. Other rooms looked at the various other revolutions throughout the Iron Curtain – be they abortive (Hungary, 1956 or Prague, 1968) or the successful and almost simultaneous fall of Communism in 1989. 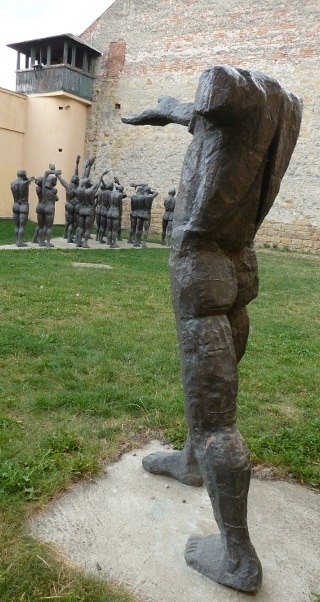 The former yard of the museum now contains a couple of sculptures and memorials, complete with a backdrop of the prison wall, barbed wire and watchtowers. All in all, thoroughly absorbing and involving – we left after considerably more hours than we expected, absolutely exhausted, into rain, with a parking ticket on the van’s windscreen… We did our bit for civil disobedience against the regime, and thoroughly ignored it. A much more cheerful destination awaited us, a few kilometres further on, in the village of Sâpănța. A cemetery. Not just any cemetery, but the Merry Cemetery. 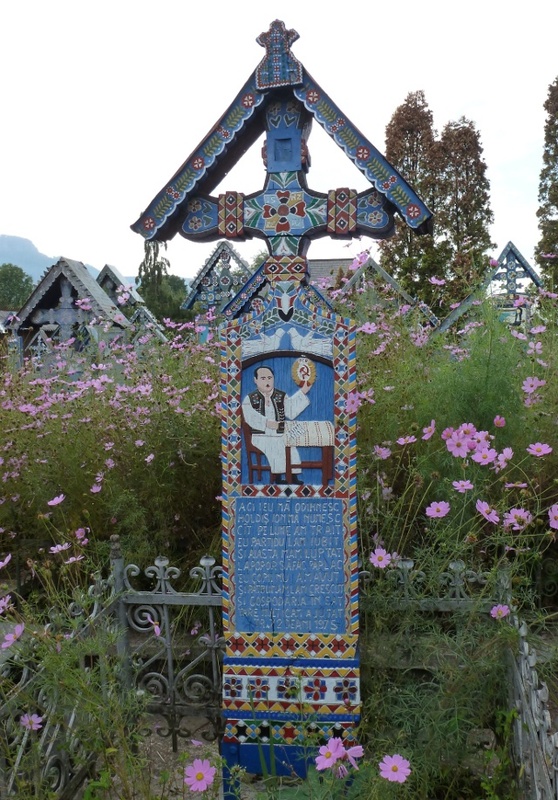 In the mid 1930s, one of the local villagers – Stan Ioan Pătraș – started to sculpt wooden headstones, with a little illustration from the deceased’s life and a short epitaph. Painted in bright colours, intended to celebrate life rather than commiserate death, the illustrations aren’t always reverent – several are quite graphic about how the deceased met their end, under the wheels of a train, drowned in a river or decapitated by enemy soldiers. The epitaphs themselves were a bit lost on us, but we’re assured that they’re witty rhymes extolling the praises of the deceased – or giving a salutatory tale about their life or demise… Row after row, their blue backgrounds and gaily painted details sit, surrounded by tourists unloading from coaches and wandering up and down the aisles briefly. The original sculptor is, himself, commemorated with a colourful headstone – of course. 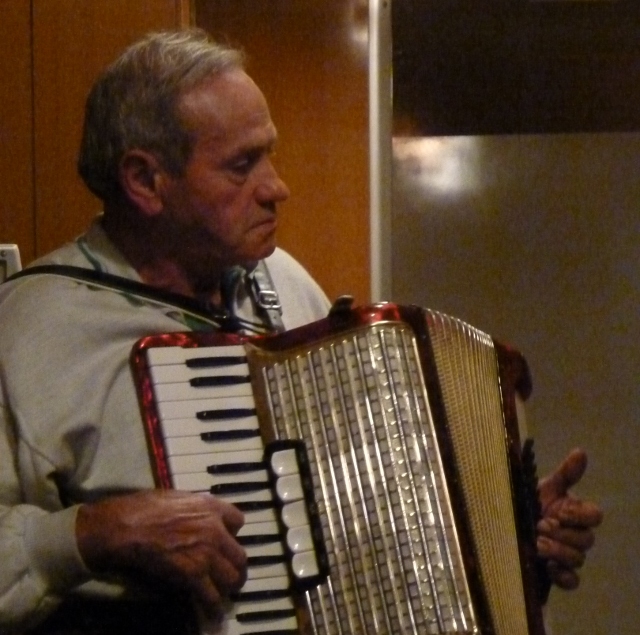 He trained up an apprentice, Dimitru Pop (known to everybody as Tincu). We followed the signs to the house where Stan Pătraș lived all his life, now a museum, and suddenly spotted a strong resemblance between the old chap who sold us the tickets and the young Tincu in a couple of the photos. 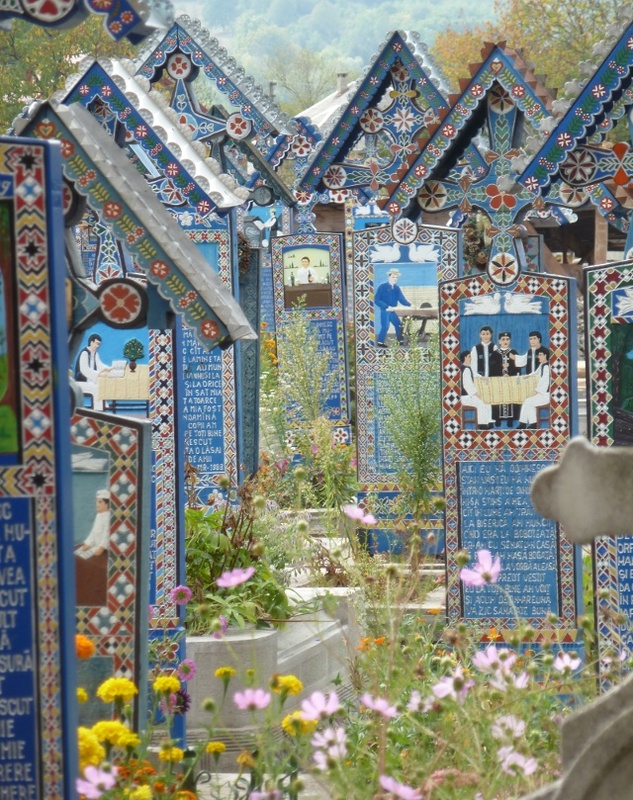 Once we’d seen both rooms of the tiny house, with the few bits of wall visible between carved plaques painted to look like wallpaper, we were taken round to the small lean-to at the side, and shown several half-finished headstones in progress. Since they’re all the same basic layout, it looks like a small stock’s always kept, carved and painted blue, for the illustration and rhyme to be filled in when required. Due to linguistic shortcomings, we couldn’t ask what we really wanted to know – when somebody’s getting on a bit, and their own requirement gets imminent, do they insist on editorial control of their own rhyme and illustration…? We decided to give the train another day for the weather to improve, so headed into the countryside for a night at a campsite that, we hoped, couldn’t be less like the one in Sighet. The village of Breb is way, way off the beaten track, and the camping wasn’t even in the middle of it – small finger-board signs pointed us down a narrow, twisty and very rough dirt track for more than a kilometre before we arrived into a sylvan glade, with a couple of small traditional wooden houses peeking out from the trees on one side of a large grassy area. We were greeted by Matthijs and Eveline, a young Dutch couple who’ve spent the last year renovating and converting a barn into a hostel and campsite. The little old lady who used to own the house still lives there, in a “granny annex” separate building, whilst Matthijs is spending every single spare minute working on the main house – he’s got a fairly strict deadline, as Eveline’s about eight months pregnant. The countryside around Breb is the centre of the area known for beautiful and ancient wooden churches, but whilst we weren’t enjoying the change in the weather too much, Matthijs and Eveline were – it was the first rain they’d had for far too long, and the wells and springs supplying the village with water were at risk of drying out. We fell in love with the area, though, and decided that we’d return to Breb after we’d been on the train. It just wasn’t worth trekking around the villages in the rain. Instead, we headed back to Sighet, to have a look at a couple of other museums in the town. One commemorated an ex-resident of the town, Elie Wiesel – the Nobel prize-winning author and survivor of Auschwitz. The shop his family ran has been restored to show a reasonably typical early 20th century Jewish way of life in the area, together with a little insight into the scale of the holocaust’s impact on Maramureș. The other, the local ethnographic museum, gave the usual taster of life-through-the-ages, with some beautiul carved wood in particular – but in a wonderfully dusty and down-at-heel way that made you wonder if anything had been changed there since Communist times. We escaped the town, still with the rain coming down heavily, and headed back to the sawmill’s car park in Vișeu, and settled in to wait the weather out. The station’s refreshment hut turned out to contain a side room, with more information on the way in which the local Jewish community had been devastated – the mill had been Jewish owned, and Vișeu de Sus had had one of the largest Jewish populations in Maramureș. Today? None. Some came back after the war, but then ran from Communism to Israel. When Friday morning came, we peered out of the van curtains – and were totally uninspired by what we saw. Not the train, but the weather again. We ummed, we ahhed. We decided that it seemed daft to spend a good chunk of a day freezing our damp bits off and not seeing anything much from the train – the hills the line headed into were playing hide-and-seek with us through cotton wool. We’d spend another day in the carpark, doing nothing much apart from playing catch-up with our way-out-of-date blogging. As evening started to fall, the power went out. Not just the van. Not just the sawmill. No lights visible anywhere around. Oh. Our leisure battery’s not in the first flush of youth – and not really the right type of battery (just a normal car battery, so running it low isn’t great for it’s life expectancy) – so it’s not the most capacious. Sitting in the van powering the lights and some music is one thing, but add in the laptop chargers, and we’d probably be in the dark before bedtime – and we’d lost the sawmill’s WiFi internet, too. Besides, we were about ready for a change of scene after sitting in the van all day. So we found ourselves in the dining car of the hotel train – several beautifully restored old carriages sat just behind a large steam loco, on the far side of the yard. The chef – a cheerful, rotund Swiss lady – seemed to be coping without electricity admirably with the help of a large gas barbecue in the very cramped dining car’s kitchen… When we arrived for dinner itself (set menu, set time), we found that we were sharing with what appeared to be a single large party of cheerful Germans, who’d all arrived in a minibus sign-written by a local B&B. One couple did a double-take on us, and informed us that they’d spotted us back at Moldovitsa monastery – they were normally motorhomers, so had noticed our van, then been very surprised at the British plates. We got chatting to three Bavarians on the next table, together with a young local chap, Daniel, who we’d already chatted to briefly that morning in the ticket office. Daniel’s English was close to flawless, and we had a very interesting conversation about the realities of Romanian life. When morning dawned, it was quickly clear that we’d made exactly the right decision to wait a day. It wasn’t quite a perfect blue sky, but there was a sky, and it wasn’t leaking. Before long, the car park started to fill up – then, with a hiss and a chuff, the star of the show arrived. This entry was posted in Art & Culture stuff, By Country - Romania, Food stuff, Personal stuff, Travel stuff, Van stuff. Bookmark the permalink.